January is known as the month of making new resolutions...and breaking them. Many people use the start of the year to reset their focus on health, resolving to exercise more and to improve their eating habits. Regardless of the goal, the majority of people who make New Year's resolutions don't keep them. Failure to stick with resolutions often occurs because the goal set was unrealistic or not meaningful for that person. 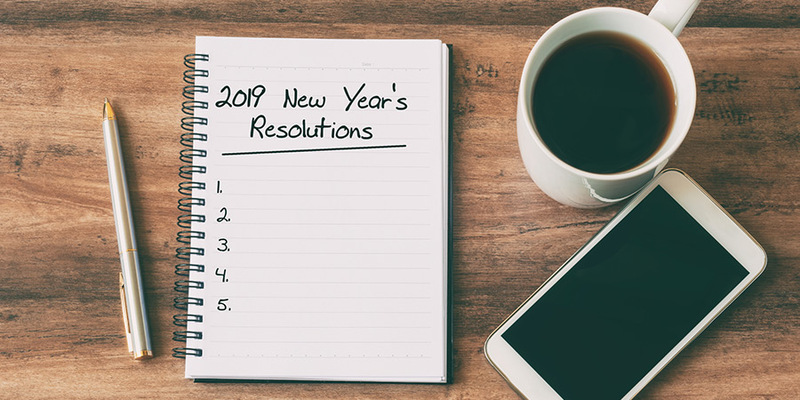 If you are serious about improving your health in 2019, consider using the acronym SMART to help you reach your goals. SMART stands for specific, measurable, achievable, realistic, and timely. So what does this mean? SPECIFIC — Make sure that your goal is defined and clear. This will make it easier to keep. Instead of simply resolving to eat healthier, set a goal to decrease your sugar intake or increase the amount of lean protein that you eat. MEASURABLE — You should be able to track your progress towards your goal. If you want to lose weight, set a specific amount that you want to lose by a certain date. Being able to see your progress is a great way to stay motivated and to catch yourself if you start regressing. ACHIEVABLE — There is no point in setting a goal if it is impossible to achieve. When deciding on a resolution, choose something that will stretch your limits, but that you are still able to do. If you don’t exercise regularly, running a marathon that takes place in two months is unlikely to happen. Running a 5K race in three months is a more achievable goal. Check out our Couch to 5K training instructions! REALISTIC — Your goal has to make sense. Say you want to learn to swim. It’s unrealistic to start in the deep end of a pool and expect you’ll be able to swim laps right away. Starting in the shallow end and practicing over time is a better approach. TIMELY — Create a timeline for yourself to reach your goal. Having a deadline and markers along the way is a great way to see how far you've come and to hold yourself accountable during the process. It is important to keep in mind that the most common and obvious goals may not be the best ones for you. Losing weight sounds attractive, but it may be more important for your health to focus on quitting smoking or lowering your blood pressure or cholesterol first. Your primary care physician can help you determine the best health-related goals for you and provide you with resources to help you stay on track. For more information about GBMC’s primary care practices, visit www.gbmc.org/mydoctor.